If your worst nightmare had a soundtrack, the Aztec death whistle would be prominently featured. In the hands of a skilled user, the instrument creates the spine-tingling wail of a thousand tortured souls being carried on a cold wind–with the screams and death rattles of a few wild jungle animals mixed in. Listen at your own risk, however; once heard, this unnerving sound cannot be forgotten. Scientists are still piecing together the story of these ancient Mesoamerican creations, which usually are made in the shape of human skulls or animal heads–mouths open and teeth bared. One was found beneath Mexico City in 1999, clutched in the skeletal fingers of a sacrifice victim in the ruins of a 650-year-old temple of the wind god. The location suggested to some that the whistles were intended to evoke the sound of the howling wind. But archaeologists at the time mistook the artifacts as toys. It took 15 years before someone actually blew that particular ancient instrument, which had been relegated to a museum shelf. The sound deeply rattled those who were there to hear it. Although not an archaeologist, mechanical engineer Roberto Velásquez made a name for himself in his studies of the complex whistles. 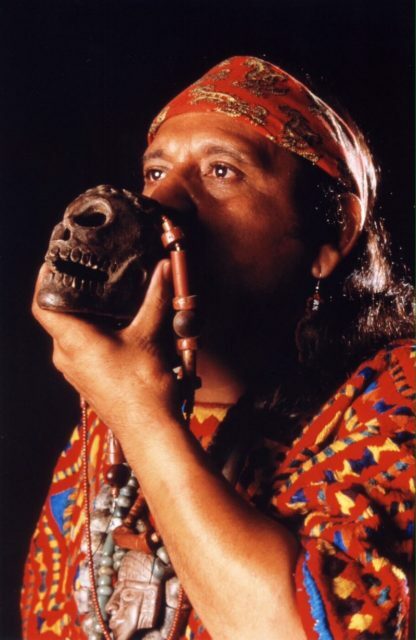 He said the whistles are not a common instrument and may have been reserved for sacrifices–perhaps to guide the soul to the afterlife–or for war, where the sound of hundreds of advancing whistles could surely unhinge Aztec opponents. 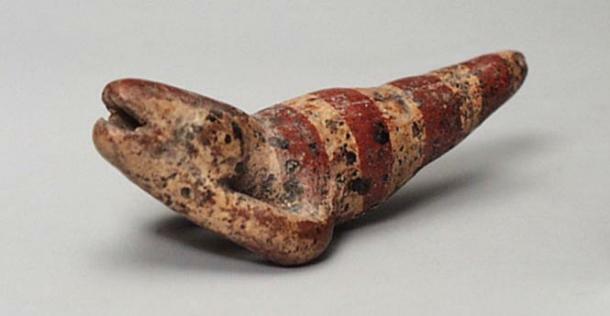 Whatever their purpose, the whistles give more dimension to lost Mesoamerican civilizations and their study. “We’ve been looking at our ancient culture as if they were deaf and mute,” Velásquez told The Associated Press. “But I think all of this is tied closely to what they did, how they thought.” The instruments also have pulled in a variety of professions in their study. Archaeologists have been joined by musicians, craftsmen, and historians. Even some medical doctors are taking part. Some experts believe the pre-Columbian instruments were used to send the human brain into a dream state and, from there, treat certain illnesses. With that in mind, the whistles could be used in modern research on sounds’ effect on heart rates and states of consciousness. Velásquez himself has produced a variety of replicas, some that emit a strange cacophony at a frequency that is barely in the range of human hearing. Velazquez has traveled across Mexico to examine newly unearthed wind instruments, some dating to 400 B.C. He often makes replicas, but then he must figure out how they were intended to be played. It took him a year to find the inner croak on one frog-shaped whistle. The death whistles have created not only new pathways of study into the indigenous history of Mexico but also a popular cottage industry of reproductions. Many are aimed at Day of the Dead or Halloween celebrations. 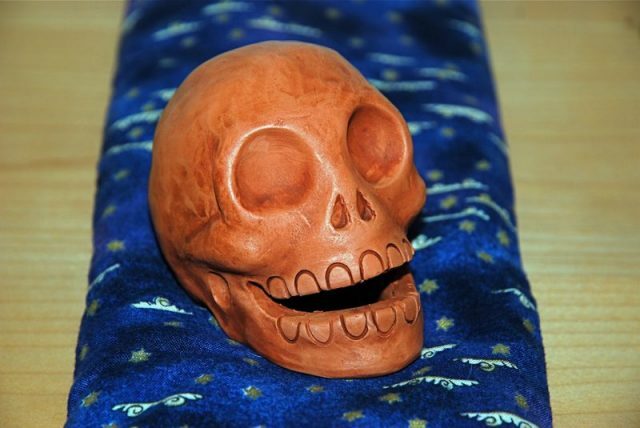 A wide variety can be found on Etsy sites, one touting “the loudest and most ear-piercing screams you will ever hear.” There are versions made by hand out of epoxy resin and leather. Others have been reversed-engineered through the modern technology of 3D printing. The ancient instruments are entering modern popular soundscapes. 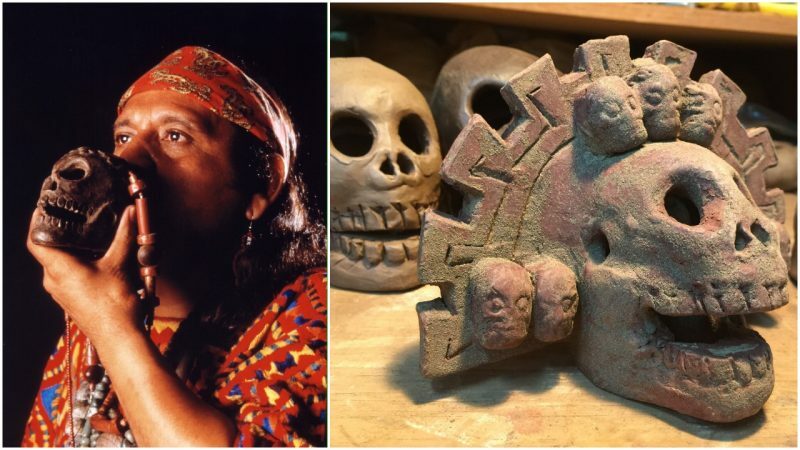 Xavier Quijas Yxayotl is an award-winning flutist known for his Aztec and Mayan music re-creations who fashions death whistles out of ceramics, jade, and stone. His instruments were used in Mel Gibson’s movie Apocalypto, which brushed aside typical orchestral soundtracks for indigenous music and sounds. Yxayotl, who bridges the gap between ancient past and present as a music historian and gifted instrumentalist, also uses ancient manuscripts to reconstruct by hand instruments used by his pre-Hispanic ancestors. Filmmakers have also recognized Yxayotl’s expertise. Highlights of his career include playing indigenous sounds at the opening ceremony of the 2001 Nobel Peace Prize honoring the Dali Lama, performing onstage at the 2002 Grammys, playing in the PBS special “Fire Flute,” and performing with Yanni in the DVD “Yanni Voices” for Disney.